Find hotel near Byron Bay Community Marke ..
Held every Sunday in the Butler Street Reserve this market stretches out over several acres and has an array of interesting stalls. Here you will wind art, craft, woodwork, fresh local produce and a host of other wares. There is also live entertainment provided by buskers and music bands. The food and drink stalls offer fresh local cuisine. The stallholders themselves are a spectacle with their elaborate and eclectic costumes. Kids too will have a good time here, as there are plenty of activities to keep them engaged like face painting, tie dying, candle making, and rides. The market is one of the best and by far the biggest in the region and a must visit for local flavour and culture. It is advisable to get here early to allow a few hours to explore. Pets are not allowed in the market. The market is on open ground so ensure you have you hat, sunglasses and sunscreen. Carry cash, as some stalls may not accept cards. Love this? Explore the entire list of places to visit in Byron Bay before you plan your trip. Fancy a good night's sleep after a tiring day? Check out where to stay in Byron Bay and book an accommodation of your choice. How popular is Byron Bay Community Market? People normally club together Arakwal National Park and The Wreck while planning their visit to Byron Bay Community Market. 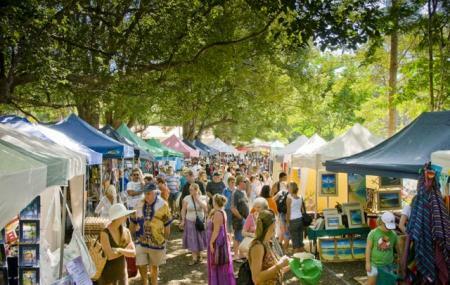 People also prefer to start their day with Byron Bay Community Market.